I drove into Newberry Springs looking for Tony's Garage, the Bagdad Café and an old abandoned motel I remembered seeing back in 2013 when I was in the area for a Munzee Clan War activity. My luck was much better than Huell Howser's when he visited the town, as I found everything I was looking for and more. Watch the video at the end of this post for a great episode of Huell's California Road Trip. Newberry Springs has been in existence for quite a while, as it’s been a reliable source of water for travelers, settlers and the army (Camp Cady was located a few miles away) since the mid-1800s. Perhaps the town’s greatest claim to fame is the Bagdad Café. It’s not the original Bagdad Café, however. That was located a little farther east on Route 66, in the actual town of Bagdad (which is no longer in existence). When the movie Bagdad Café was filmed in this area during the late 1980s, the Sidewinder Café soon became the Bagdad Café and has remained so ever since. At one time a gas station and small hotel were also at the café location. I pulled up in front of what used to be the Henning Motel, it has definitely seen better days. I'm not sure how long it's been abandoned, but as the doors were open, I grabbed my camera and decided to see what I could find. It looked like the Henning Motel was once a nice little place to stay the night. The rooms were decent sized and there was a small patio area where I'd bet it was fun to sit and watch the cars go by on 66. I'm guessing that toward the end of its business life, it was probably more of an apartment building than a motel. I was saddened to see that the motel has been razed and completely removed. I hope someone is able to save the old sign. The Bagdad Cafe is located just east of the Henning Motel building. It's open for business and if you're in the mood for a Buffalo burger, that's on the menu. Tony's Garage is just a bit farther east on 66. It hasn't been open for business for quite some spell, but it sure takes a nice picture. This home intrigues me. If there's ever a severe snow storm in Newberry Springs, no snow will settle on this roof. 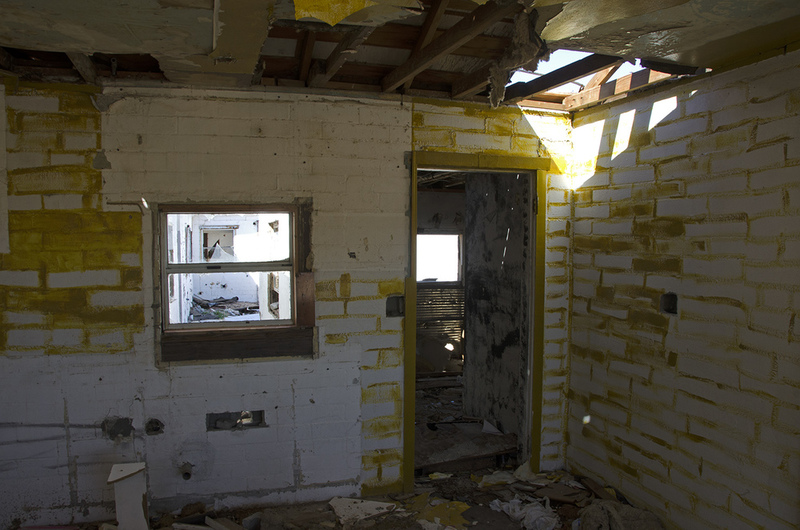 An abandoned home on the east outskirts of town. While I was there, a gentleman was looking the property over with thoughts of purchasing the property. I love watching Huell on his California Road Trips and California Gold shows. He always made the best of the situation, no matter how crazy things went, as evidenced in this episode.